We can all admit to the sensation we experience when a recent purchase finally arrives in our arms. So when the courier asks for a signature to receive that new pair of oxfords, so begins the ever-present battle to preserve our prized footwear. All too often we realise that we have become negligent, so we here at Gatsby are breaking with tradition. By overcoming some small, although often very destructive habits, we can end the cycle of abuse that our footwear is often subjected to. As soon as they are out of the box, it’s time to get polish. They won’t need any now, but to preserve the colour that left the factory floor it’s good to try and match it up before the shoes get too much use. Obviously black polish is black polish; where tan is concerned it’s good to find the right shade as quickly as possible. At this point, it would be stupid to advise against wearing a new pair of shoes in the rain – the Great British weather has a knack of ruining even the best intentions. Should misfortune occur however, stuff with newspaper once home – but avoid placing them under direct heat. When they’re dry to the touch, the restoration work can commence. For anybody who has purchased shoe trees, now is the time to use them – they’ll provide much needed support to the shoe whilst working lovingly at its buttery leather. If not, don’t worry, the previous day’s newspaper (or the same day’s depending on what you buy) can be stuffed in to retain shape. Remove the laces – it’s important to polish the tongue of the shoe as well. 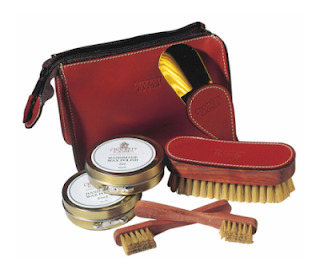 Now, take either a brush or a cloth – both are good – and wipe away any dirt that the leather has managed to attract. Applying conditioner is not a necessary precursor to every polishing, but when doing so, apply with a cloth in small, circular motions. Leave until they are fully dried before proceeding. With another cloth, steadily apply small amounts of polish evenly across the shoe. Consider paying attention to the welt, since proper care for this will prolong the trip to your local cobbler. When the upper is complete, flip the shoe upside down and conduct the same process on the sole – it’s leather as well and should be treated as such. Polishing done, put the shoes aside and exchange them for a well-earned drink. Once your polish has dried, take a clean cloth or another brush and, again in a small circular motion, begin to shine. To achieve a high gloss finish, quickly dab a cloth with a little water and a minimal amount of polish, giving the shoe one last buff. The result should be dazzling. “If it’s worth paying money for, it’s worth looking after” – this cobbler’s words of wisdom are an excellent rule to bear in mind when it comes to shoes. When taking them off at the end of the day, glance at the heel to make sure it isn’t becoming worn down. Returning them to the manufacturer is the best course of action - it's better to have the best quality repair work done, rather than run the risk with a cheaper cobbler. With the soles, adopt another approach: run a finger around the insole of the shoe where the ball of your foot should sit. If it feels soft, the sole needs replacing. Nobody likes to suddenly feel a damp sensation running through their socks. Consider His Royal Highness, the Prince of Wales. Impeccable tailoring aside, his shoes are a statement in their own right. Ancient uppers and soles that would make a teenager feel their years. With the right maintenance a good pair of shoes will last for a long time, so invest in something timeless.